When the teacher laptop initiative was announced by the previous Minster of Education, Naledi Pandor, in May 2009; it received wide acclaim across the board. While most of us were commending this progressive move, we forgot to ask a key question: how is it going to be implemented from the first of July 2009, the targeted roll-out date? While we should have known better, we felt Department of Education (DoE) deserved benefit of the doubt. The cliché so fitting when it comes to the government came back to haunt us. All together now: the devil is in the detail. Almost 2 years down the line, teachers are still waiting with bated breaths while DoE is battling to finalize the funding model for buying of laptops. As can be expected, the chorus of concerned media voices is growing (see “Laptops-for-teachers plan falters” in The Times of April 26, 2011). Despite these challenges, I am glad that Angie Motshekga, the Minster of Basic Education, has not once blamed the so-called previous administration for poor planning. My sense is that she is soldiering on because she believes in the initiative. I must declare that I genuinely believe Angie is one of the true action heroes of the present administration. Remember the once-famous OBE that is now in the scrap heap, thanks to her? How do I digitize basic education syllabuses, to strengthen the case for use of computers in class? Given the teacher population that numbers 400 000, how many of them are computer literate and how many have laptops already? How do I convince teachers that using laptops in class will enhance delivery of their lessons, and thereby increase average pass marks? Should I start the roll-out with senior or junior teachers? Linked to the question above, and assuming that seniority is directly linked to time spent in the teaching profession, what is the chance that junior teachers are a better bet as they may be more open to experimenting with digital lessons as compared to senior teachers who may be set in their ways? How do I get all key stakeholders – other government departments, student bodies, school governing bodies, teacher unions, relevant private IT service providers and other interested parties – involved to ensure this project is comprehensively planned, successfully implemented and sustainable? How do I develop a mutually beneficial public-private partnership given scale of the project? In line with the question above, how do I solicit active corporate participation in ensuring all boxes are ticked in relation to specifications of key elements of the project – hardware, operating systems, file management and database management systems, systems interfaces, software, Internet access, hardware and systems security, training, IT support and maintenance? How is this project going to be costed and financed? How are we going to know whether implementation is successful? Lastly, how can we turn this project into an entrepreneurial opportunity, and how do I ensure SMME’s and BBBEE’s benefit from it? For me, the last question would be important because it is the inverse of an admission that we as the government stuff up otherwise awesome projects due to inherent inefficiencies in the system. 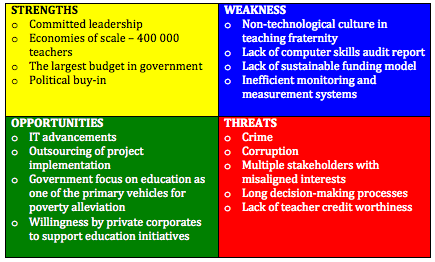 The SWOT analysis would be followed by putting in place a roadmap to ensuring successful implementation of the initiative. As part of developing the roadmap and relaunching the initiative, I would ensure that I stick to my knitting – and that is develop the vision, clearly define rules of the game, ensure a comprehensive plan is in place, outsource the implementation to competent service providers and use robust key performance indicators to keep them true. Well, of course I am not Angie. 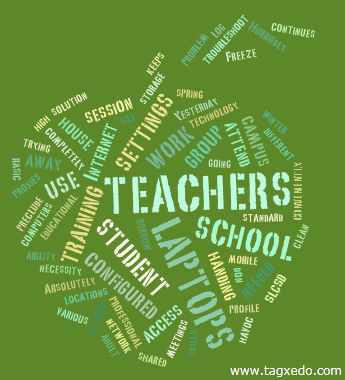 But I hope she takes note of my input as a concerned citizen who, like her, believes in the teacher laptop initiative.